A top quality Search Engine Optimization (SEO) team operates much like a good clothing tailor. A good tailor knows that one size most definitely does not fit all people so in order to get a great fit; one that is comfortable for the wearer, the tailor uses a large number of measurements in the planning and different kinds of stitches in the creation of the garment. SEO works in exactly the same way. Businesses are different. They are different in their customer base, capabilities, business models and even personalities. Some businesses are local, limited in scope to only small regional areas, while other businesses are global in reach. A local tree trimmer for instance will have very different needs than a business selling yachts, even though the businesses are the same size. Both of these businesses have very small niche customers but even so, the SEO plan for each will be very different. 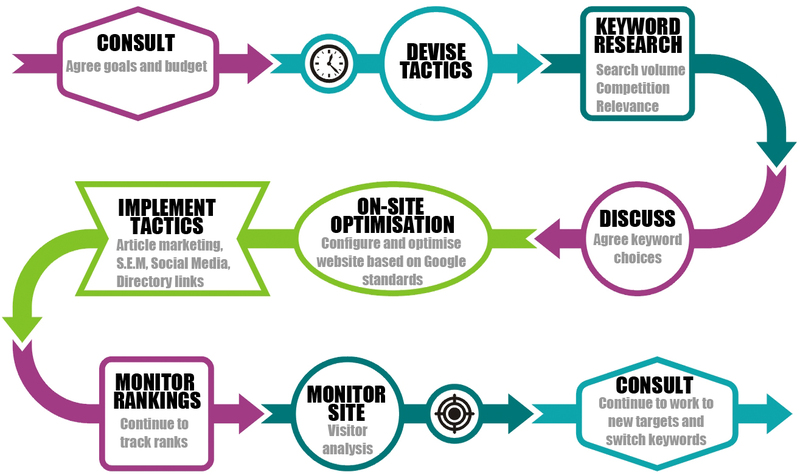 The first step in tailoring your SEO efforts begins with developing a plan and prioritizing each step. The problems usually begin because many people lack the training to deal with changes in an increasingly ambiguous data model. The reason why experience and training is so important here is because our brains tend to look for patterns that are not there when we examine analytics. The fact is that while about 80% of businesses use collected data but less than 40% of those people have the skills and judgment to use the data in the correct manner. Because there are literally hundreds of SEO tactics in use today prioritization is vital if you want to maximize your results. This includes both preemptive and defensive SEO tactics. The best place to start is to consider the scope of your operations and the platforms you plan to use. The world of search engine optimization and marketing is changing all of the time and targets are becoming more and more precise. One of best new SEO offensive tools available in 2014 is SEO for mobile. In a world where homeless people have Smartphone’s and everyone is connected mobile marketing is becoming big business. One Neilson Report said that a full 48% of mobile consumers begin their purchase with a paid organic search and another report by BI Intelligence said that more than 60% of all online devices are either Smartphone’s or tablets. The computing world is finding smaller and smaller devices and going on the road while PCs and laptop are sitting on the shelves. Mobile SEO is extremely important if you want to keep your business on pace with a rapidly changing landscape but there are also cross platform tools as well. Social networking is expected to be able to reach 2.55 billion people before 2017, which essentially means that one in for people in the world will be actively using some form of social networking and already about 88% of internet marketers are using social marketing already this year. SEO tactics are great for manipulation of search engine ranking but social media gives users the advantage of reaching far beyond search results and going directly to the consumer. Social networking can be used for everything from customer support, research and development, promotional offers, branding, human resources along with of course sales. The biggest challenge for users of this tactic is to correctly scale the effort across your company or product line. This requires a clear understanding of which areas of social networking add the most value to the effort.